SANCTAPHRAX WILL BE destroyed by the energy of the Mother Storm. . . .
Far over the Edge, the Mother Storm is brewing—a storm more terrifying than any seen in the lifetime of any Edgelander. Sweeping in from the open sky, it must strike the source of the Edgewater River to bring new energy to the land. But in its way is Sanctaphrax, a magnificent city built on a floating rock and tethered to the land by a massive chain. Only one person can save the Edgelands from certain disaster: Twig, the young sky pirate captain who dared to sail over the Edge—and returned with his memory shattered and his crew flung far and wide. But to recover his memory and take action, Twig must first find his lost crew. And this means a journey back into the Deepwoods, and beyond. . . .
Paul Stewart is the cocreator of the bestselling Edge Chronicles series, with Chris Riddell. He is also the author of a number of previous titles for children including The Wakening. 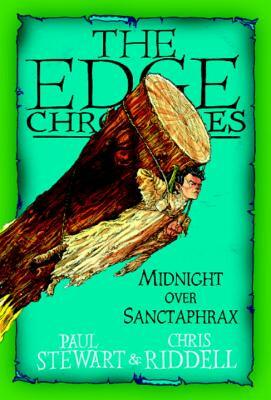 Chris Riddell is the cocreator of the bestselling Edge Chronicles series, with Paul Stewart. He has illustrated many children's books, including the award-winning Pirate Diary. He is also the political cartoonist for the Guardian and Observer newspapers.